So sorry I haven't been writing much lately! It's been a busy couple of weeks, especially with CBC Music's Searchlight contest for Canada's Best New Artist. But we have great news - we've now made it to the top 10 in the whole country with the song that Avid Napper and I wrote, The Longest Night. So just be patient with my absences from this blog for the next little bit, at least until they finally kick us out. I also had an interesting discussion about the seal hunt with the frontman from the Canadian band Stars. If only all political debates could be this civil. Have a great weekend! More adventures to follow! Sometimes there are times when you just know that you'll remember that day as being special. Everyone still talks fondly about that beautiful day last summer when everyone went to Long Point Beach and enjoyed the rare warmth of the hot sun. Those who missed it still regret it. Those who were there cling to that memory on the coldest of winter days. I think we had that moment again this long weekend. Good Friday felt not only good, but gloriously warm after a long cold winter. With the windchill, it had been close to -40 all week, but suddenly at the beginning of our four-day weekend we found ourselves shedding our fur parkas and Canada Goose jackets as the day warmed up to a sunny -10 degrees. It was unheard of. We were practically sweating. It seemed like the entire town decided to head out to West Arm that day to enjoy the day. We brought along our "down south" winter jackets (the winter coats we would wear in Ottawa or Toronto or somewhere else equally tropical) and loaded into the truck to drive out on to the ice road. The ice road was a lot clearer than the last time we had driven on it; there was no stunt driving this time, and a second lane actually opened up with a proper median separating the traffic and everything. It was probably the fanciest road in all of Nunavut! Unfortunately, I didn't realize that one road was for going to West Arm and the other road was from coming from West Arm, and I ended up driving down the wrong way down a one-way road for the entire way there. With the ice wall medians, there was no way for me to get to the right lane once I realized my mistake. But, I mean, since when are there one-way roads in Nunavut? And to be honest, who was going to pull me over? The polar bears? Once we got to West Arm, we realized that pretty much everyone in town had the same idea that day, and the area was full of people hanging out and kids sledding. Of course, by "full" I'm talking Nunavut standards so there was still plenty of empty space in the Arctic wilderness to find your own hill to hang out on. look at that sun dog! Once we found our private hill, the boys stripped off their coats so they can suntan under the warm sun, which was giving off this beautiful rainbow sun dog that morning. We girls tried out the snowboards. F. tried his hand at snowboarding too. ...but eventually switched to the sled. It was basically my ideal day. Sunny warm weather, friends to hang out with, a bit of adventure, and tea. ALSO. YOU GUYS. THANK YOU FOR VOTING US AS YOUR FAVOURITE NUNAVUT BAND FOR CBC MUSIC'S SEARCHLIGHT. What would we do without you? Please keep voting for us for the national rounds! 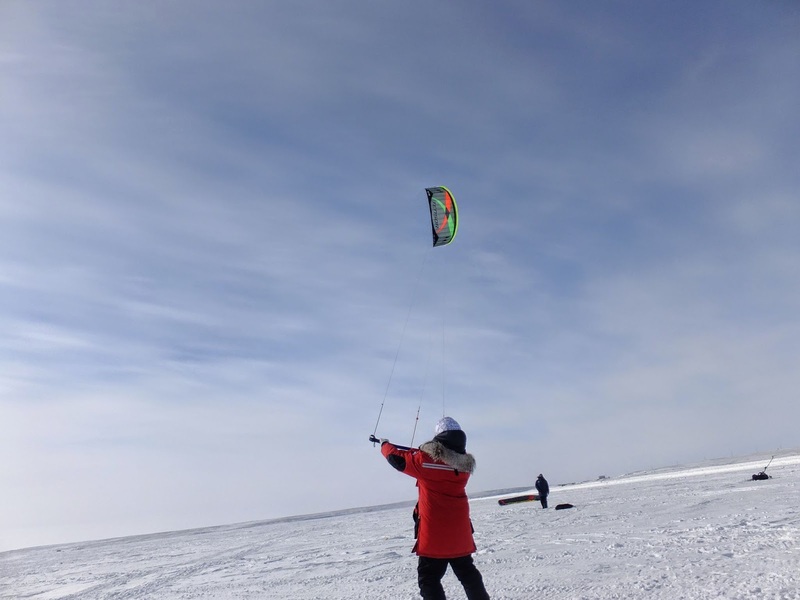 There's a pretty good kiting crowd here in Cambridge Bay - kite-surfing in the summer, and kite-skiing or kite-boarding in the winter. They're really friendly and they always seem open to letting newcomers try it out. This weekend I joined them on the ice with the intention of just photographing them, but ended up trying my hand at the trainer kite. Controlling the kite seems like an easy concept in theory, but it's a lot harder in real life. The wind can change at any moment, and even on a day where it doesn't seem particularly windy, one gust of the wind and sudden turn of the kite could feel like your arms are being ripped off. You have to react quickly and watch what is going on at all times. Having the quick reflexes of a snail on sleeping pills, I may or may not have accidentally dropped the kite down on trucks/people multiple times. It's good to try these things out in the middle of nowhere, safe and far away from obstacles/victims. 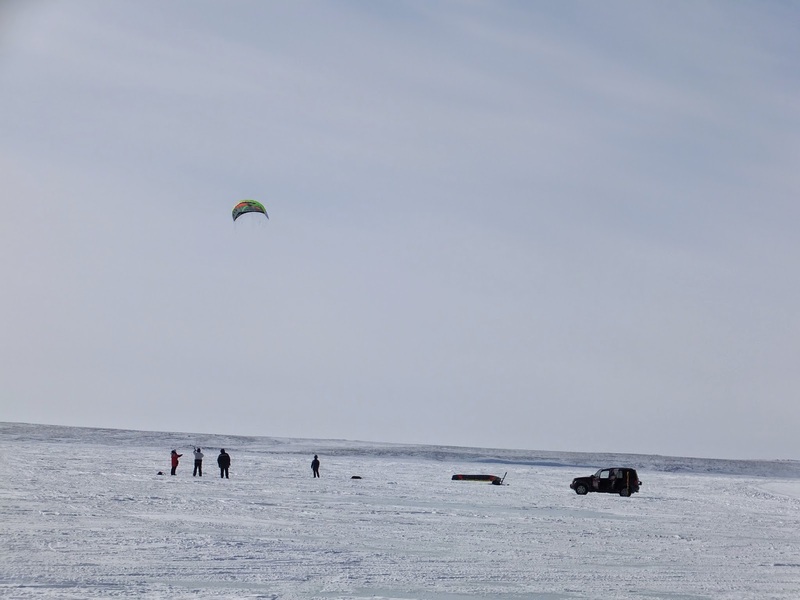 We were in the middle of the frozen Arctic ocean, but my kite still managed to find things to drop down on. I started to view the kite as a living thing, an animal that you have to pay attention to, to predict its behaviour and attend to its needs. 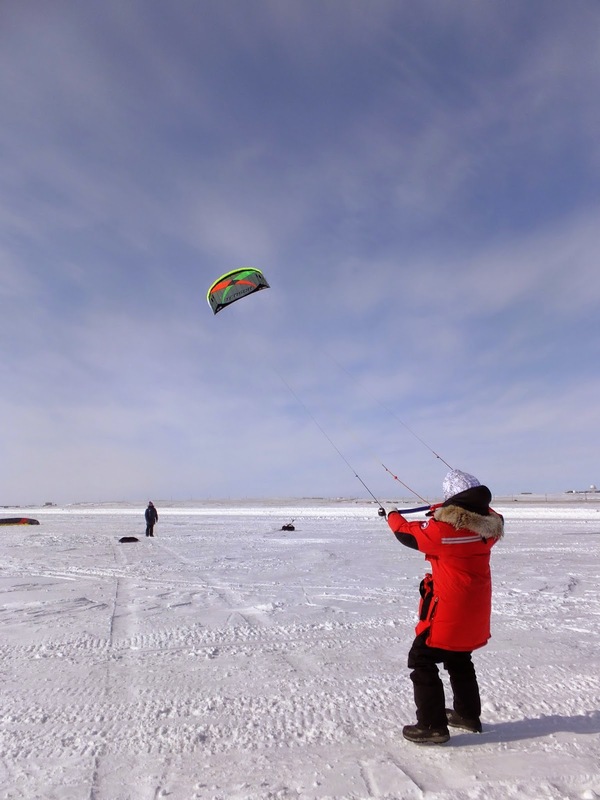 M told us you never turn your back on the kite when you're out on your board, because one bad move, one gust of wind, and you're being dragged across the Arctic Ocean halfway to Bay Chimo...and not necessarily on your feet either. But you treat it right, and you could be having the thrill of your life, flying across the ice like you're riding on the back of a hippogriff. Who knew that kite flying could be so fun? Then M. strapped on his skis to show us how it's done. I feel pretty lucky that activities like this are available to me pretty much on my front step. I just have to walk out my door and down towards the dock and there waits another Arctic adventure. With the sun setting close to 10PM these days and next month, not setting at all, we've got all the time in the world to go on adventures. It was only -25 degrees and everyone could feel spring in the air! My friends were going out for their first jog of the year, or going for leisurely strolls outside, taking in all the warmth. Some went for bike rides. Brent and his ridiculously awesome winter bike, that he uses to BIKE ON THE FROZEN ARCTIC OCEAN. Look at those tires! We barely knew what to do with ourselves in this unseasonable warmth. What am I supposed to wear in -25 degree weather? When was the last time I felt that? I could imagine teens going streaking in this weather. I decided with the warm weather, it was time to take up snowboarding. I'd never gone snowboarding before, so why not learn how to do it in the Arctic? 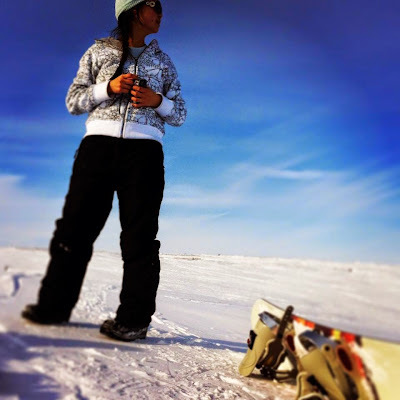 Where's the nearest ski resort to Cambridge Bay, you ask? Well...the whole tundra kind of is our ski resort. Just pick a hill and tear down. No expensive prices for lift tickets. We walked over to Jack's Point, mainly because it's a four-minute walk from my house and if you go any further, you're snowboarding in the dump. Snowboarding in the Arctic surprisingly means sweating a lot, because after you snowboard down the hill, you have to walk up all those hills on your own. What, you think there are chairlifts in the Arctic wilderness? Sometimes folks on snowmobiles did stop to watch us, but not to offer their assistance in hauling us up the hill (like I secretly hoped), but rather to laugh hysterically at the sight of me, falling down the hill. I don't fall as much when the ground is flat. My Canada Goose parka became unnecessarily warm during these treks. Unbearably warm in fact. Next time I'm snowboarding in my long underwear. Luckily, Jack's Point had a fairly comfortable slope for beginners like me, except for that cliff ridge that appears out of nowhere if you slide too far east, as I discovered on my first run down. I eventually mastered the skill of making it to the bottom of the hill without falling once. Except I still hadn't figured out how to turn or stop. The problem is if you don't stop in time, you'll continue right on to the frozen Arctic Ocean ice. And then you'll just keep going...and going...until maybe you'll hit Kugluktuk on the mainland. So you gotta learn to stop. My main method of stopping was to fall down. I'm really good at falling. I learned a lot of important lessons. Like, contrary to what you might think about outdoor sports in the Arctic, wear less clothes. Also, as I also learned when I surfed for the first time, balance is not really my strong point. But I had a lot of fun and I'm eager to hit the slopes again to try to learn all the other important snowboarding stuff. Like turning. And stopping. psssst...can you vote for our song The Longest Night for CBC Music's Searchlight Contest? Thanks! I figured out how to use my tripod and turn on the night mode on my camera, just in time for the blood moon eclipse last night. I first noticed the moon while walking home from snowboarding. It was hovering just above the horizon, eerily huge. I tried to take a picture of it, but it never looks the same on the screen. I decided to stay up that night to watch the eclipse. We run on Mountain Time up here, so I wouldn't have to stay up as late as you ordinary folks in the eastern time zone, but still it was definitely past my bed time. It was worth it. So I set up a lawn chair on my front step and watched the moon while listening to Cat Power on my headphones. ...and then got cold. So at around one in the morning, I went inside and watched from my living room window instead. Which, as it turned out, had just as good a view. Then I realized the northern lights were also out at the same time. Nunavut is a magical place. I went outside for a walk. The next night, the moon was even fuller and brighter, although it was no longer blood red. Next month, the sun will stop setting. I am going to miss the night. Have you voted for us today for CBC Music's Searchlight contest for Canada's Best New Artist? a new mixtape for you!